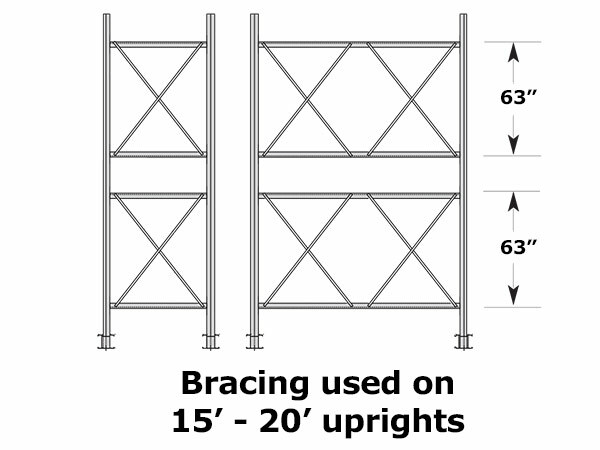 Meco cantilever rack brace sets hold the upright columns in place. They prevent uprights from falling sideways as well as proportionally spacing the uprights to the width of your choice. 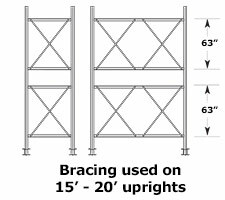 Choose the proper brace set that corresponds with the upright height and spacing chosen. These sets come with four braces per set including X-braces. Color is gray. *Length of brace is measured from the center of one upright to the center of the other upright. These heavy duty 16'H double-sided Meco upright & bases are used with heavy duty arms and brace sets. These extra heavy duty 16'H double-sided Meco upright & bases are used with extra heavy duty arms and brace sets. These extra heavy duty 20'H single-sided Meco upright & bases are used with extra heavy duty arms and brace sets. These heavy duty 10'H Meco cantilever rack double upright & bases are used with heavy duty arms and brace sets. I've used these racks and they hold up compared to other racks I've used. Very user freindly to use day in and day out. Easy to pick and stock from.